On Sunday morning, April 29th, it was time to say goodbye to the Little Farm on the River and head to our next destination but when we left we weren’t exactly sure what or where our next stop was going to be. 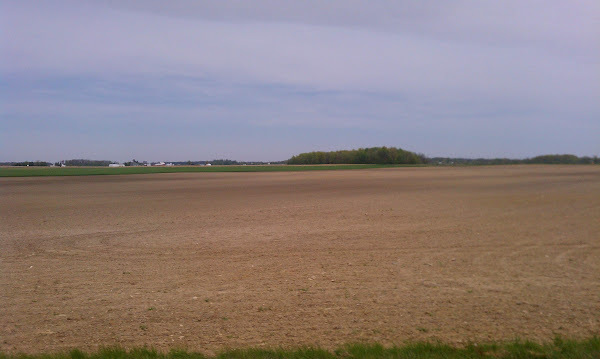 Since we planned on taking the Fleetwood tour Monday morning, we wanted to stay somewhere reasonably close to Decatur, IN, yet not too far afield from our intended path north and east. 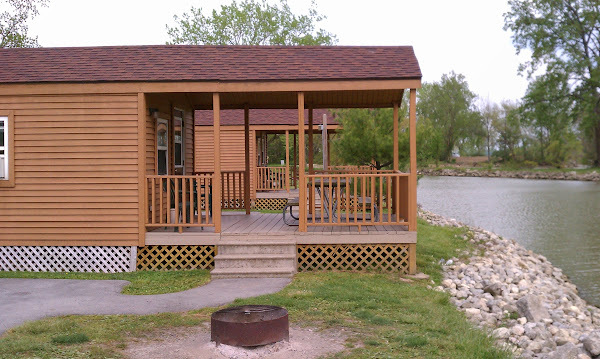 We narrowed it down to two places near the Indiana border and just over the line in Ohio; Grand Lake St. Marys State Park and the Mercer County Fairgrounds in Celina. 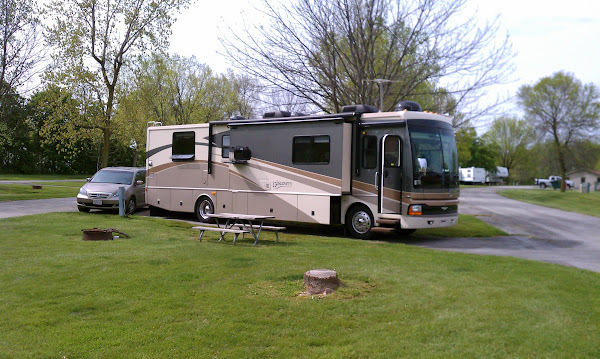 Both are Passport America campgrounds. We could have stayed at the Fleetwood Service Center for no charge but Rob didn’t want to drive that far west in the coach (and then back again) and thought it would be more economical to drive the van the two hour round trip to the Fleetwood plant. So we headed out without reservations anywhere. 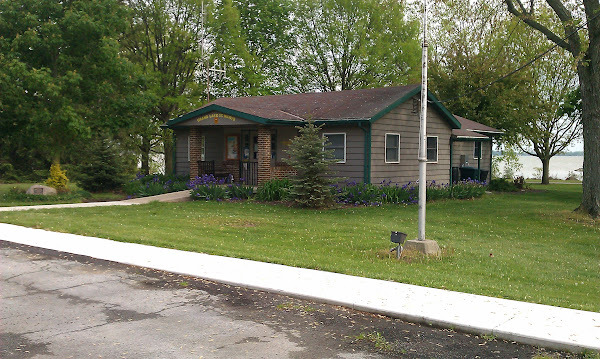 We figured we would stop at Grand Lake St. Marys and if that didn’t look good we would continue on to the second option. Around 11:00 a.m. just as we were about ready to leave, Bill and Colleen came over to say good bye and to wish us a safe trip. 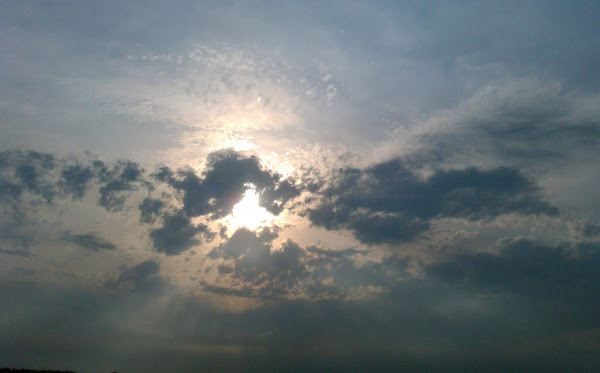 We thoroughly enjoyed meeting them – who knows maybe some day our paths will cross again! As we exited the campground, we turned right onto State Road 56, heading towards Aurora. Just before Aurora, there is a short cut to cross over the river to State Road 50 that most GPS will recommend you take. If you are in a big rig, don’t do it – the bridge weight limit is only 6 tons and it’s narrow. Just follow the signs and stay on 56 until it intersects with 50. 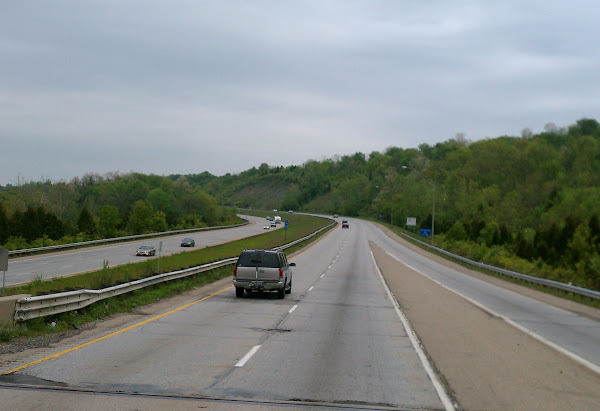 Within a few miles on 50 east of Lawrenceberg, we picked up Interstate 275, the beltway around Cincinnati. After just a few miles on I-275 we crossed the border into Ohio, then at exit 42 we exited onto Interstate 75 which headed north towards Dayton. 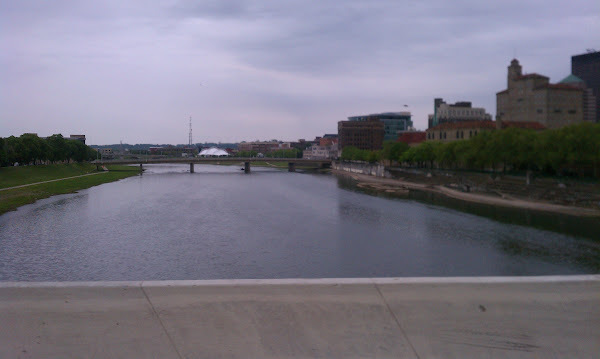 We had commented on the fact that there wasn’t much traffic which makes sense since it was Sunday but we should have kept our mouths shut – as we got closer to Dayton it became more and more congested. 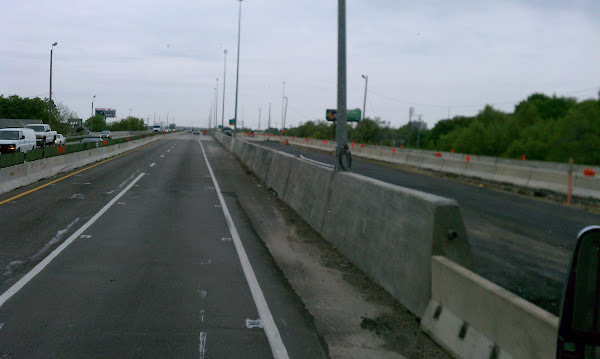 Plus there was a lot of construction – even though they weren’t working since it was Sunday, the lanes had narrowed down to 2 with jersey barriers or barrels on each side. As is often the case, there was some confusion on the part of the GPS ladies – both of them were giving Rob different directions. Mrs. Garmin wanted us to get off at mile marker/exit 93, Mrs. Google wanted us to stay on 75 until mile marker/exit 110. Based on the AAA map, it didn’t look as though it would matter – either route would get us there. So we got off at mile marker 93 and took State Road 29. Our only concern was that perhaps we would run into a low bridge but thankfully that didn’t happen. SR29 was a two lane road but at least it was flat and had a decent shoulder. 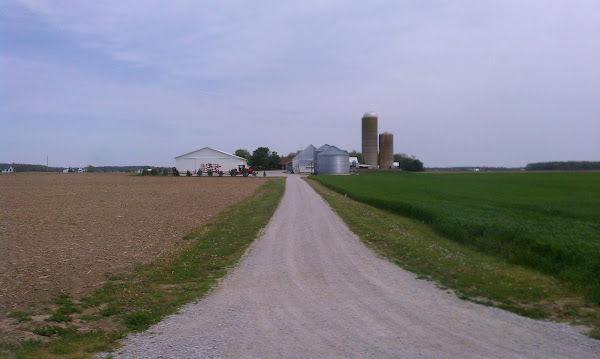 We knew now we were in farm country, passing by mile after mile of fields and lots of barns and silos. 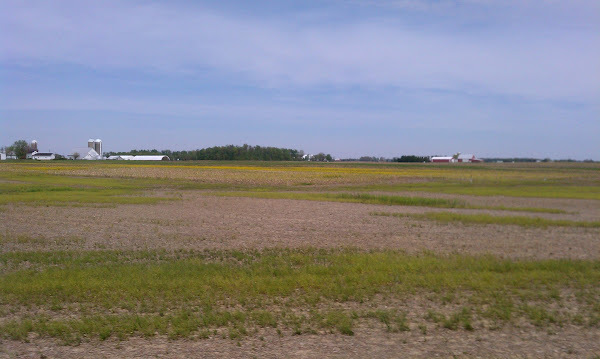 Most of it looked like corn fields but since the fields had just been planted, we really couldn’t tell. Definitely different terrain than what we have been seeing over the past few weeks. From SR29, we turned on SR274 heading west then SR364 heading north which brought us in to the town of St. Mary’s. We then turned on SR 703 heading west. The sign for the state park at the main road was so small that we drove right by it but that turned out okay, Rob wanted to fill up with diesel and fortunately there was an easy access gas station with diesel ($3.99/gallon) just past where we were supposed to turn. After the fill up he was able to easily turn around and head back to the state park entrance. At the gas station was another building, the Villa Nova Drive-Thru. Since they had a sign for pizza, I thought it was some type of fast food restaurant but I soon realized it wasn’t. The cars would pull into a covered area, almost like an open ended garage, which was lined on one side with what looked to be refrigerated coolers. As I watched, cars would pull in, a girl would come out to the car and talk to the driver, then she would go off and return with a six pack of beer, coke, pizza or whatever. I’ve never seen a drive thru liquor store (not sure if they sold hard stuff or just beer and wine) before and was even more surprised they were selling liquor on Sunday. 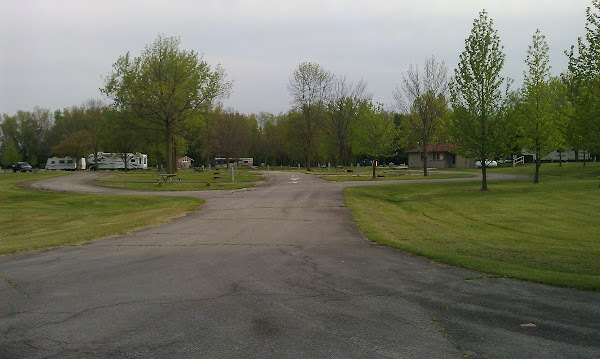 For future reference, if you visit this campground we would recommend taking Mrs. Garmins’ advice and using exit 110 off I-75 then following 4-lane SR33 west. 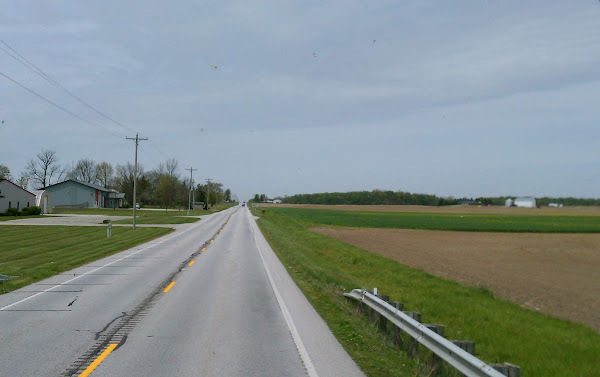 At the SR33/SR29 cloverleaf (don’t exit) the 4-lane will become SR29, continue a short distance to the next exit and take Koenig Rd heading south. Then turn left (east) on SR 354 and the primary campground road will be on the right. This approach eliminates the confusion we had finding the proper campground entrance. Anyway, we finally made it to the campground. When we arrived at the gatehouse, there was no one there but there were instructions about picking out a campsite and paying for it if you didn’t have reservations. As we stood there reading the signs, a couple in a car came by (they turned out to be campground hosts) and asked if we needed help. They explained that the gatehouse wasn’t open for the season yet and the park service office was also closed on Sunday but we could go to the office on Monday morning and settle up with them. 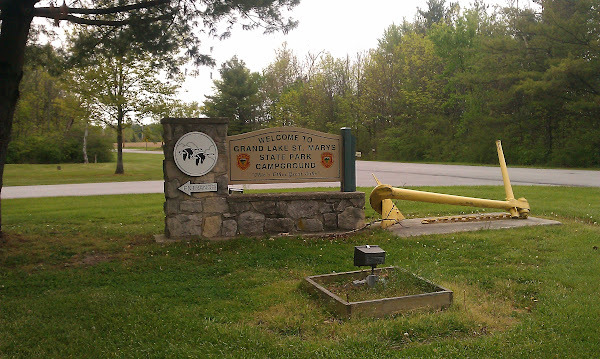 The campground which is located right on the banks of Grand Lake has 207 campsites, each with a picnic table and a fire pit, plus 5 cabins. The paved roads as well as the sites are a little narrow but very manageable even for a big rig. Although the campground was open, it definitely was not fully operational as yet. 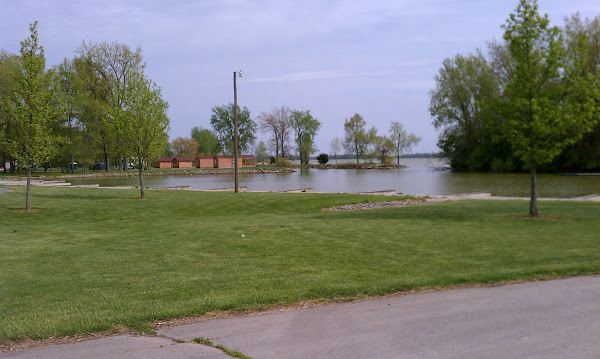 Other amenities include: a pump out, multiple bath and laundry facilities, a camp store and nature center (neither are open yet), an amphitheater, a playground, a fishing pier, small docks on the camp lagoon, a launch ramp, horseshoes, basketball and volleyball areas. Bike rentals and canoe rentals are also available. 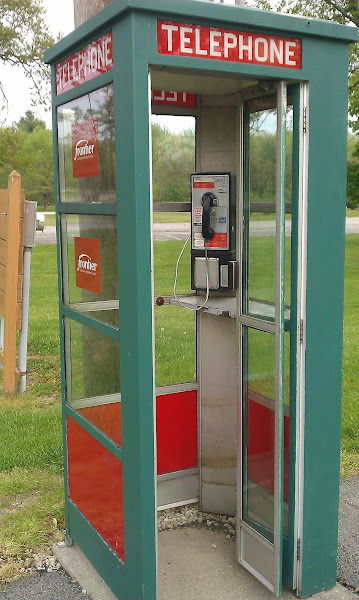 It even has a phone booth! (wow, there’s a blast from the past!) It must be a hopping place in the summer! That night we cooked hamburgers on the fire pit. Tasted so much better than those that we cook on the gas grill! 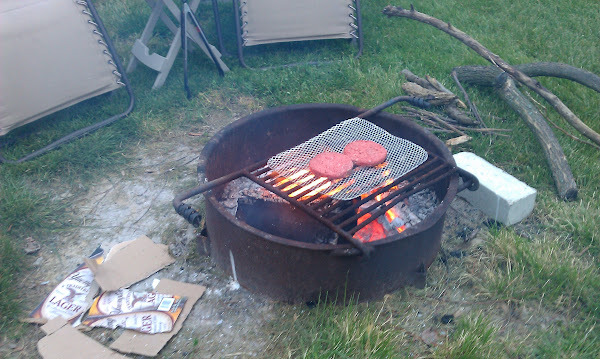 We had bought some disposable aluminum cooking grates at Walmart and those have worked out well for cooking over the open fire. 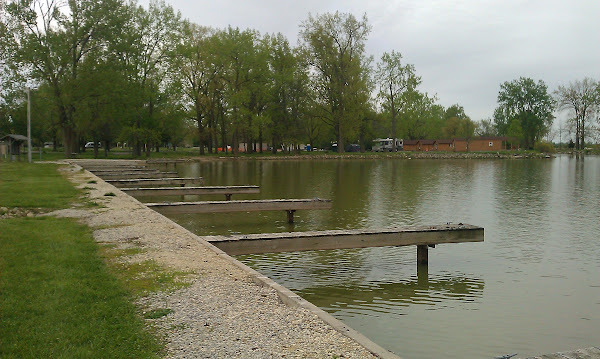 From our campsite we noticed two small barges with large white tanks constantly being pushed across the lake and were curious as to what they were doing (a photo of the barge can be seen on the right but it was too far away to get a good shot). 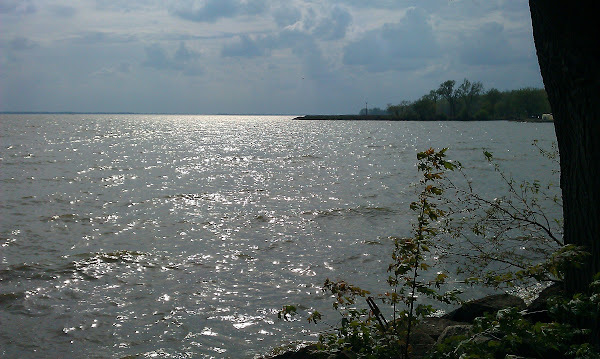 Apparently G rand Lake, which is Ohio’s largest inland lake, has become increasingly enriched by phosphates and nitrates from a number of man-made and natural sources. 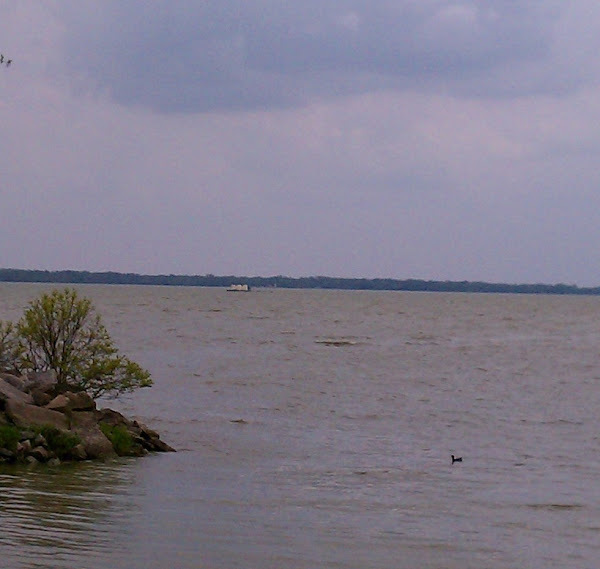 These nutrients have contributed to the decline of the lake’s water quality and has upset the natural balance of the lake and as a result has increased the growth of toxic blue-green algae. They have been struggling with this problem for three or four years now. In an effort to slow the toxic algal bloom, the chemicals, aluminum sulfate and sodium aluminate, are dispersed into the water from the barges. Each barge disperses about 15,000 gallons of the alum treatment at a time, covering about 30 acres of the 4900 acre lake – it takes about a month to cover the entire lake. To view an interesting YouTube video about the treatment, click here. 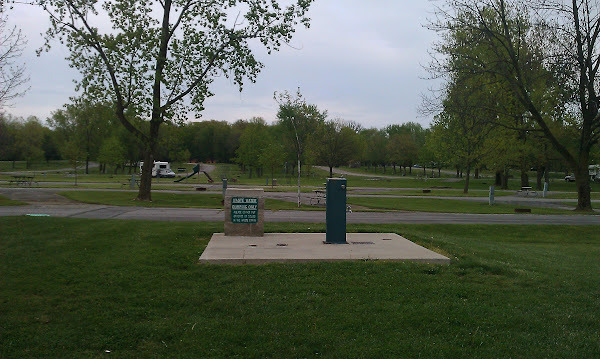 In regard to facilities, this campground has electricity only and no water or sewer at the sites which is not an issue for us for a couple of nights. Oddly, the power posts for the sites are on the passenger side for some reason and include 50/30/20A outlets. Our power on site #194 was very good at 123v on both legs of the 50A. For water, we noticed a few spigots where presumably it is possible to get fresh water, although for many sites it might not be practical to run a hose – for convenience you might want to tank up before you get here. Also, something we haven’t seen before, there are grey water dump stations strategically placed around the grounds – more or less small sinks integrated into a stone pedestal where you could carry over a bucket of water to dump. Of course there is also a dual bi-directional drive-thru dump station. For OTA TV we managed to get all the major networks including PBS with some antenna direction tweaking and maximum gain on the Winegard Sensar Pro. Also, the digital channel assignments were unusual and not quite as reported on antennaweb.org or similar sites. Here is the actual channel layout we encountered: NBC-8.1, FOX-8.2, ABC-35.1, CBS-35.2, PBS 27.1, 27.2, 27.3. It’s rare to see different networks broadcast on a sub-channel of the same primary channel. For internet access, Sprint and Verizon 3G were very good. There is also free WiFi at this campground. The info sheet states you need a reservation number to gain access to the WiFi but we connected and were not challenged for a password. We used our Pepwave WiFi booster and had excellent signal strength, although performance at the backend was only adequate – with only a handful of campers here congestion was not likely a cause for slowness so we predict the WiFi here will be poor with a full campground. 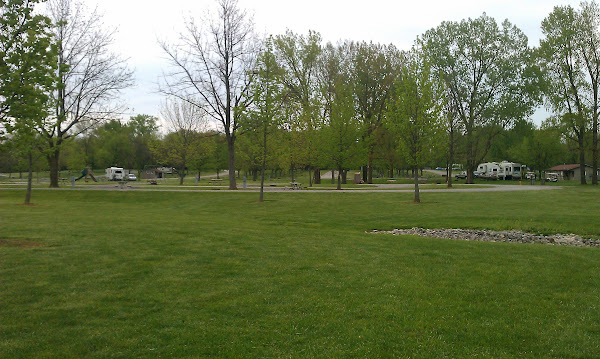 Overall this is a pleasant place with grassy, nicely spaced sites and paved parking pads. There is not a lot of visual privacy between sites and many are not level. Some of the pads have dips so may make it difficult to level certain rigs. All sites have a fire ring and the electric hookup is on the passenger side. The site pads are very short in some cases, so check the online descriptions carefully. Sites #158-207 are pull thru’s, the rest are back-in’s. Our pull-thru #194 is typical of the others and was barely long enough for our 40′ coach, although we managed to squeeze the car in by parking it sideways. Some of the other pull-thru’s are even shorter, so if you have a big rig don’t expect to keep the toad hitched if reserving a pull-thru here. Also, the main gate is a little tight so use caution when entering.